The Financier Worldwide October 2018 issue deals with the issues and potential impacts that the recently adopted Act on Nullity of Loans with an International Element Concluded in the Republic of Croatia by Debtors and Unauthorised creditors may produce on numerous credit arrangements concluded within the last 15 years. In the June 2018 issue of the Financier Worldwide magazine, a focus has been put on validity of terminating the employment of a pregnant employee during the probation period in light of recent changes to the Employment Law. In the May 2018 issue of the Financier Worldwide magazine, Hrvoje Vidan analyses effectiveness of restrictive post-employment non-compete covenants end elaborates on the role of the Croatian employment courts in interpreting their scope of application and validity. After conducting a research of legal market in 89 jurisdictions and based on the opinion of law firms, clients and labour, employment and benefits experts from around the world, Who’s Who Legal has recognised Hrvoje Vidan as one of the world’s leading practitioners in this field. In the article “Croatia: systemic risk and state intervention” the authors Hrvoje Vidan & Mihaela Malenica analyze contents and potential legal consequences of the recently adopted Special Administration Procedure Act popularly known as ‘the Lex Agrokor’ which was enacted following the major financial crisis that had engulfed the Agrokor Group – Croatia’s largest privately owned company in the retail and food production sector. Will major Croatian tax reform boost investments and reduce outflow of workers? In the article “Will major Croatian tax reform boost investments and reduce outflow of workers?” the author Hrvoje Vidan analyses reasons for the introduction and possible outcomes of a comprehensive tax reform introduced by the Croatian Government as of 1 January 2017. Hrvoje Vidan and Mihaela Malenica were invited to participate in 2016 October issue of the Financier Worldwide, a monthly magazine delivering in-depth commentary, research and practical analysis to bridge the gap between theory and practice in the complex world of finance and business strategy. The article “Investing in real estate in Croatia-tricks and traps to avoid” provides an overview of basic features of Croatian real estate law by combining unique journalistic reporting and professional expertise. Honored by invitation to participate in the 2015 edition of Doing Business in Europe published by Thomson Reuters (Professional) UK Limited providing a general explanation of the laws of each country, Hrvoje Vidan accepted to contribute by elaborating on Croatian laws and the business environment outlining essential legal information for European businesses and their advisers. Hrvoje Vidan has been invited to cover the chapter - Croatia for the 2nd edition of Getting the Deal Through – Debt Capital Markets, published in association with Cleary Gottlieb Steen & Hamilton LLP. The newly published and rebranded 2015 edition of Debt Capital Markets provides in-depth global insight written by local experts, covering a diverse range of relevant and up-to-date topics, including: public and private debt offerings, special instruments, derivatives and securities, transfers of debt, transaction liabilities and remedies, and the regulation of underwriters. Hrvoje Vidan contributed to the fourth edition of The Real Estate Law Review published by the Law Business Research Ltd in February 2015. The Real Estate Law review features 35 jurisdictions and gives an overview of the state of the global real estate investment market by providing updated information on key developments in a number of jurisdictions and their impact on the relevant domestic and wider global real estate market. The Real Estate Law Review offers real estate practitioners and their clients an immediate and accessible summary of the position in the many countries covered, as well as the global real estate market as a whole and therefore may especially serve to the multinationals, in-house lawyers and legal professionals. Following to the 2014 edition which has been accepted with the great interest, Hrvoje Vidan from Vidan Law Office has been asked for the second consecutive year to participate in writing the professional publication Employment & Labour Law – Jurisdictional comparisons, the Sixth edition, published by Thomson Reuters (Professional) UK Limited. The publication is conceptualized as a practical guide for academics, legal professionals and students providing high-level insight into the employment law of more than 21 jurisdictions world-wide. 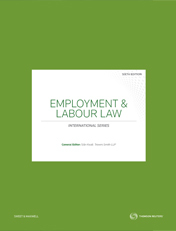 The Employment & Labour Law – Jurisdictional comparisons may especially serve to the clients having international operations, in-house lawyers or HR professionals as an excellent guide providing global overview of employment law. Following the last year issue of the independent survey Legal 500 - Europe, Middle East and Asia which acknowledged Vidan Law office as a recommended firm in the fields of Banking, Finance & Capital Markets, Dispute Resolution and Real Estate & Construction Law, this year Vidan Law Office has been included in the prestigious list of the top Croatian law firms in two new areas of law: Corporate & Commercial and Intellectual Property.